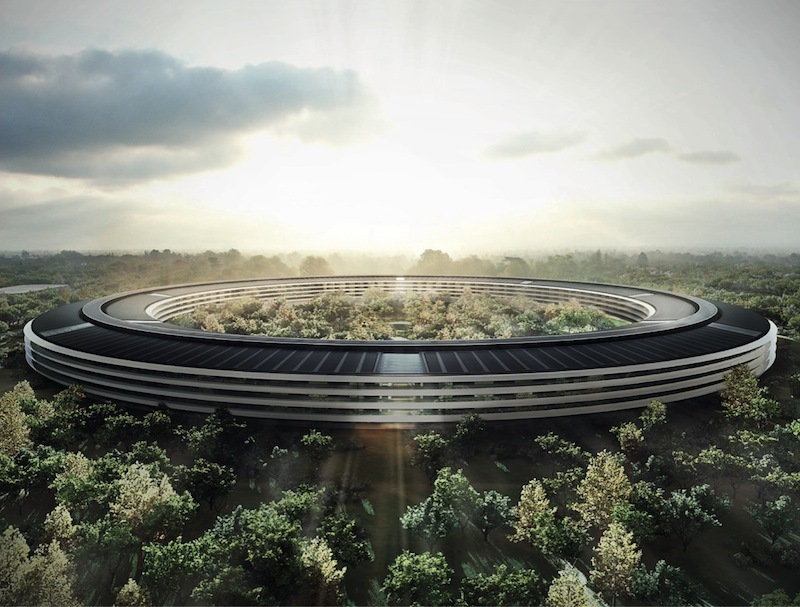 Following approval of Apple's plans for its new "spaceship campus" by the City of Cupertino's Planning Commission earlier this month, the full Cupertino City Council has just given its unanimous approval to the project at its October meeting. The approval came after more than six hours of discussion this evening, with many statements of support and some expressions of concern from members of the community, and the approval was met with significant applause by those in attendance. Today's approval is final pending any petitions for reconsideration, which must be filed within ten calendar days. If no petitions are received within that period, Apple will be granted ancillary permits to begin demolition of the former HP campus currently located on the site, as well as utility relocation, tree removal, and construction of a temporary sound wall. The formal agreement between Apple and the City of Cupertino must be given a second public reading, scheduled for the council's meeting on November 19, and Apple's full set of permits would go into effect the following day. Apple's plans for Phase 1 of the project call for a 2.8 million square foot ring-shaped main building with an underground parking facility for nearly 2,400 vehicles, a 100,000 square foot fitness center, a 120,000 square foot auditorium, a main parking structure with space for nearly 6,000 vehicles, and assorted other minor facilities. A second phase of construction would consist of 600,000 additional square feet of office and research and development buildings, as well as other parking and energy generation facilities. Update: Apple CEO Tim Cook has issued a Tweet about the approval, interestingly quoting the title of our own article on the topic. To explore strange new designs. To seek out new hardware and new operating systems. To boldly go where no campus has gone before. What if it really is a spaceship and Captain Tim leaves all of us so we're stuck with phones with fingerprint sensors in weird places? according to KGI Securities analyst Ming-Chi Kuo, it'll be a giant Mac Pro. Hopefully once it's done they can get back to work on the PowerBook G5. Steve would never have allowed this. Money can be spent better otherwise. What planet have you been on, this was one of Steves babies. Microsoft, Google and Apple use it for office buildings the make themselves sound less corporate, my comment is specifically about how it's really weird that they do this given a campus = the grounds for a university. I look forward to your wannabe tech boy 'nah man you're wrong!!!' comments. 1 : the area and buildings around a university, college, school, etc. Our modern Pharoah, Tim Cook, finishes the pyramid to his predecessor's legacy. But alas, will he later build his own smaller pyramid closer to the road to Egypt, making it appear larger to those who visit? It was Steve's idea. In actual fact he wanted to spend MORE on different flooring structure. Tim veto'd it otherwise it would have been billions more (and no I'm not exaggerating). That's where the design idea started out. And before he passed away he said otherwise. He told Tim to keep the company "as is". Keep the company "as is", meaning keeping it's principles and core values. He never said anything about stopping the planning of the new campus.